The AVI-1 is a great way to get the best sound possible from your audio/video products in public venues, such as school assemblies, business meetings, or civic gatherings. Use with audio or video recorders, projectors, portable public address systems, phonographs, etc. 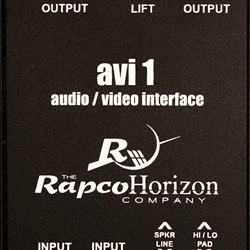 The unit has 1/4 inch, RCA, and 3.5mm jack inputs. Outputs consist of XLR male mic level and 1/4 inch line level jack. Switches include a high/low pad (-20 to +4dbv ), a speaker/line attenuator, and a ground lift switch for noise reductions. Wired with 6:1 ratio impedance-matching transformer.